The power of art, John Berger suggested, is that it often shows that what people have in common is more urgent than what differentiates them. The smart minds behind 350.org must have taken Berger's suggestion to heart. The organization’s first global climate art project, “350 Earth,” was a series of art installations that recently and simultaneously mounted in seventeen cities around the world between November 20 and 28 this year. By presenting a global mix of celebrations and large-scale public art works that show how climate change impacts all of us, “350 Earth” reveals just how interconnected the world is. Timed to take place during the lead-up to the United Nations climate meetings in Cancun, Mexico, the overall goal of “350 Earth” is to show national leaders and politicians the massive public concern that exists over the climate crisis. Participant projects were located in cities in six of the seven continents (only Antarctica was excluded), and involved varying numbers of people at each site, as well as artists and designers as diverse as: Molly Dilworth, Jorge Rodriguez Gerada, Thom Yorke, Liu Bolin, Jason deCaires Taylor, Sarah Rifaat, Daniel Dancer, and Bjargey Ólafsdóttir. Calls were often made public in advance of the commencement of a project, often on social media sites like Twitter and Facebook, and human bodies were often the main medium for each work. 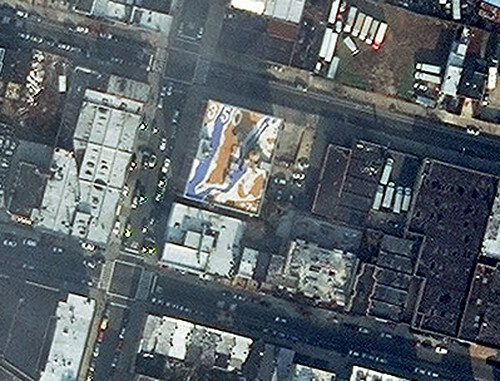 Each art installation was designed to be large enough to be seen from space, and “350 Earth” organizers arranged with the satellite imagery provider company DigitalGlobe to document the projects. Among the more evocative projects was one of the first, which took place on November 20 in Santa Fe, New Mexico, and drew upwards of a thousand area residents under the auspices of the Santa Fe Art Institute. 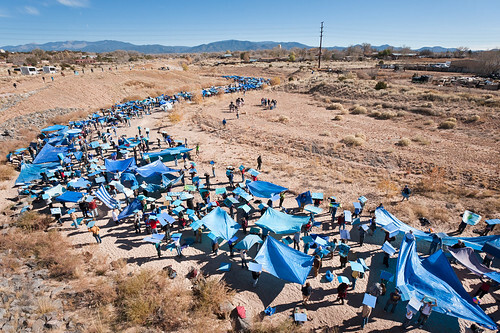 The gathered participants dressed in blue clothing and held blue placards, and they acted out a human “flash flood” in the dry Santa Fe River bed while chanting, “It's hot in here, there's too much carbon in the atmosphere!” In another noteworthy project, mounted in New York City also on November 20, a large “roof mural” depicting a flooded New York and New Jersey coastline was placed atop a city rooftop. The painting was produced in conjunction with NYC°Coolroofs, a New York City initiative encourages building owners to cool their rooftops by applying a reflective white coating that reduces energy use, cooling costs, and carbon emissions. In many of the artworks, the number 350 made an appearance. In Mexico City, on November 22, thousands of children gathered to form the shape of a huge hurricane, with “350” depicted in the eye of the storm. In the Australia outback, on November 26, volunteers carried torches and lights to form a giant “350” at night as a warning about the risk of a spread of wildfires if global warming is not halted. 350 is a significant number for the artists, the organizers, and indeed for the Earth itself. 350.org, which was founded by U.S. author Bill McKibben to inspire the world to rise to the challenge of the climate crisis, takes its name from what the organization claims to be the “most important number in the world.” 350 parts per million is what climatologists say is the safe upper limit for carbon dioxide in the atmosphere. Images courtesy of 350 Earth. Creative, truly creative. I love the Eagle! !